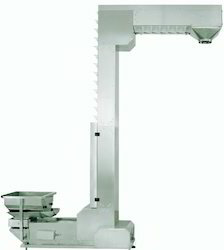 We design and develop high quality Feeder Conveyors customized to the requirements of the application. Our conveyors have been extensively field tested and have proven performance and reliability. We constantly upgrade our designs with the current technologies to achieve high efficiency with minimal running costs. We have an inhouse design team of well qualified and experienced engineers, with access to latest designing techniques and modelling softwares which help us in developing optimal designs for individual applications and their validation. We have over 30 years of experience in design & manufacturing Feeder Conveyor Systems for loading & unloading. Our ISO 9001:2008 systems certified workshop is fully equiped with fabrication equipments and is located in Noida (Delhi NCR). An Apron Conveyor is a type of conveyor made from individual apron plates that are linked together with hinges on its underside, thus creating a looped carrying surface where materials can be placed. It plays a vital part in several industries by being used to move different materials from one location to another. This type of conveyor is used to deliver a large number of materials across several phases of production and is particularly useful for transport of huge and heavy materials. Many industries consider apron conveyors to be a lifeline in their industry, including manufacturing, agricultural, and chemical industries. In the manufacturing industry, these conveyors are used to move materials across different sections during the manufacturing process; in the agricultural industry, they are used to deliver grains. Apron belts can be made to have walls that can ideal for moving materials with no containers, such as feed and gravel. In the chemical industry, apron belts are used to move hazardous materials that prevent workers from handling them.An apron conveyor works much like the tracks of a battle tank. Individual apron plates overlap and are linked together to form a closed belt or chain. A mechanism, usually composed of several metal rollers, is placed inside the conveyor belt. We manufacture Weigh Belt Feeders that find application in Cement, Steel, Fertliser, Chemical, Pharmaceutical, Food, Refractories, Ceramic, Zinc and Alum Industries. These products are manufactured with the help of highly quality load cells and instrumentation. Our Boiler Feeding Conveyor provide a conveying solution from the feed pit to the boiler. 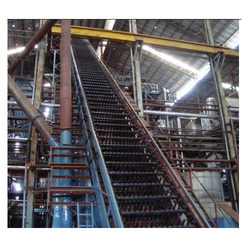 We manufacture customised Bagasse Handling Conveyor for heavy duty continuous running applications. 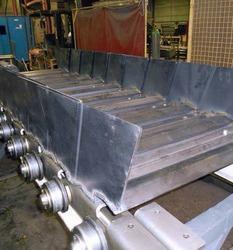 These conveyors are commonly used to offer conveying solutions from the feed pit to the boiler. Further, these are available at industry leading prices, which is our initiative to draw in more clients to experience the quality and functionality of our products. 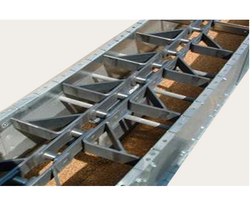 We manufacture a fine quality range of Feeding Conveyors, which are used for feeding of materials for various applications. These products are available in different specifications in terms of feeding rates, lengths & profiles and these products are widely known for their sturdiness. Our products are also used for uniform feeding to transfer belt conveyor. Open pan design provides trough for extra capacity and reduces belt friction for lower power requirements. Covers available to protect material and conveyor from wind, rain, and other contaminants. Bearings are precision, long-life, sealed, and greaseable for trouble-free, continuous duty. High gloss polyester powder coated steel, bolt-together conveyor sections resist rust. The rugged, formed frame is heavy-gauge steel for durability. Convenient adjustment for belt tension and tracking. We manufacture customized Z Type Bucket Elevator that can transport the material horizontally than vertically and again horizontally with a single drive and bucket are pendulum type and move at a very low speed. With our design the material breakage and spoilage is negligible. We use this type of elevator in lifting and packaging for various food items such as cornflakes, potato chips snacks, spices etc. 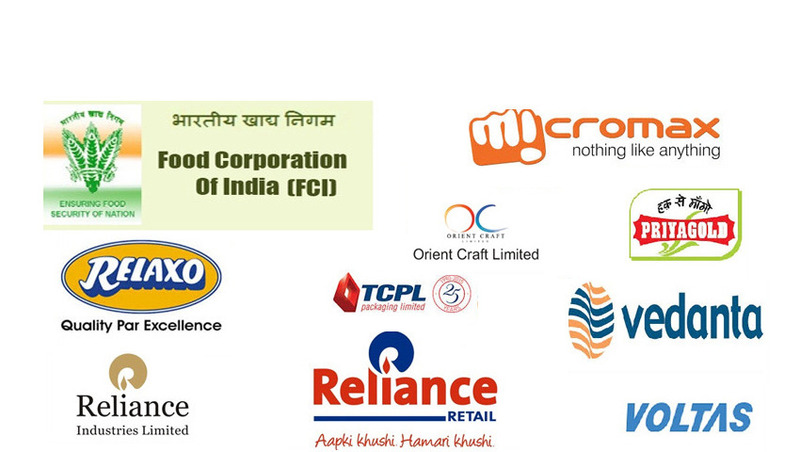 it used in various industries like spices, grains, powders and many other items.